Low-growing flowering plant in the daisy family, endemic to New Zealand. Occurs naturally in exposed, rocky areas along the coast and on inland mountains in Marlborough and Northern Canterbury. Leathery, dark green leaves, 7-17 cm long, covered with tiny white hairs. Daisy-like white flowers to 7.5 cm across, with yellow centers emerge in spring from grey-white buds held above the foliage like felted drumsticks. The flowers are followed by fluffy, pale brown seed heads. Synonyms: Olearia insignis, Olearia marginata. Of the three species in the genus Pachystegia, P. insignis is the most common, both in cultivation and in nature. Pachystegia rufa is similar to P. insignis, but has brownish felt on the flower buds, leaf-undersides, and the flower stems. Pachystegia minor is also very similar to the Marlborough rock daisy, but has smaller leaves without the white leaf margins. Prefers a sunny position in very well-draining soil. Can handle part shade, but will have a more open habit. Drought-tolerant. No maintenance required, other than pruning back if and when required. Usually trouble-free as long as the soil is sufficiently dry. Tolerates moderate frosts and is hardy throughout New Zealand. Excellent choice for exposed, coastal sites. 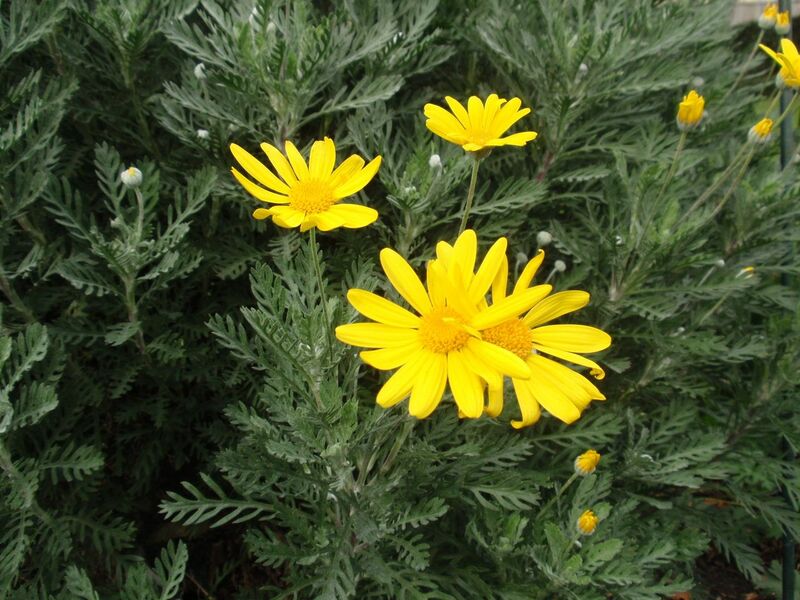 Looks attractive all year round with its grey-green foliage, silvery-grey flower buds and flower stems, the daisy-like flowers and fluffy seed-heads. Combine for example with grasses, succulents or ground covers such as Acaena inermis 'Purpurea' (as in the photographs). Evergreen perennial, native to Turkey and Syria, forming large clumps of large, heart-shaped, grey-green, rough-textured, aromatic leaves. Pale yellow flowers arranged in whorls on hairy, erect stems, appear in late spring or early summer. The flowers turn into brown seed-heads that persist on the plant well into winter, providing food for seed eating birds. The nectar in the flowers attracts bees and butterflies. Synonym: Phlomis samia. Sometimes referred to as Phlomis viscosa. Prefers a sunny position in well-draining, sandy soil. Copes well with partial shade too. Usually trouble-free and easy to grow. Once established Phlomis russeliana tolerates dry conditions. Cut back to near ground-level in late autumn, winter, or any time you no longer want the seedheads. Frost hardy (USDA zones 4-9). Propagate from seed or division. Seed-propagated plants flower from their second year on. A gorgeous plant with year-round interest; beautiful, bold ground-covering foliage with strong, stout flowering stems and attractive seed-heads. Once in flower, Phlomis russeliana can be quite dominant, so find a spot in your garden where it can be the primadonna, or combine with plants that have equally strong personalities to make a real show. Evergreen shrub with vibrant red young growth. Photinia x fraseri is a hybrid between Photinia glabra and Photinia serratifolia. The cultivar 'Red Robin' was developed in New Zealand, and is widely used as a colourful hedge. Glossy, elliptic to obovate leaves to 10 cm long, bright red when young, turning dark green on maturity. Panicles of small, creamy white flowers during spring. Best foliage colour in full sun, but is also suitable for a partially shaded position. Grows in any fertile, neutral or acid, well-draining soil. Reasonably wind tolerant. Not recommended for very exposed sites, coastal gardens or wet, waterlogged soils. Frost hardy once established, but needs protection from harsh frosts when young. A light prune during the growing season promotes the production of young leaves and thus prolongs the intense foliage colour display. Tolerates hard pruning. May be affected by fireblight, a bacterial disease that causes the leaves to wilt and turns the branches black as if the plant is scorched by fire. Remove affected plants to prevent spreading the disease to other susceptible plants. Spectacular hedging plant with brilliant red young foliage. Can be grown as a small standard tree, filler or specimen shrub. Evergreen shrub from South Africa with narrow grey-green leaves densely covered with soft hairs. Tiny flowers with a very mild cinnamon scent, surrounded by showy, hairy, golden creamy bracts appear at the ends of the branches in autumn through to late winter. Often sold as the smaller growing Phylica plumosa (.3-.6 m tall). Happiest in full sun and well-draining soil. Copes well with dry conditions and is suitable for coastal gardens. Tolerates light to medium frosts (to about -6 degrees Celsius). This would be the perfect plant for a 'tactile' garden; it feels so nice and soft. Lasts well on water as a cut flower or cut foliage, and can also dried. Once in flower, Phylica pubescens looks amazing since the whole plant is usually covered with its unusual flowers. New Zealand native evergreen shrub or small tree. Thick, leathery, obovate leaves with rolled down margins, about 6 cm long and 2 cm wide. The leaf undersides and petioles are covered with a dense whitish tomentum. Deep red, fragrant, unisexual flowers in spring, the female ones turning into three- or four-valved seed capsules which eventually split open to reveal shiny black seeds. Provides food for native and exotic birds. Originally occurred naturally near the coast, along streams and in forest margins in the North Island of New Zealand from the North Cape to Poverty Bay, and in the Kermadic Islands. Karo is now naturalised throughout most of New Zealand. Prefers a sunny or semi-shady position in free-draining soil. Tolerates wind, coastal conditions, relatively dry sites, and moderate frosts (zones 9-11). Usually quite fast growing and problem-free. Prune yearly. Benefits from mulch and compost. Tough plant with a grey-green overall appearance. Suitable for hedging purposes. The flowers release a delightful scent at night. Excellent choice for seaside gardens as a filler or background plant. Bushy evergreen tree or shrub with variegated foliage. The leaves are 10-15 cm long, 2-4 cm wide, mid green, blotched along the wavy margins with creamy white. Foliage emits a lemon-like scent when crushed, hence the common name. Terminal clusters of honey-scented, 1-1.5 cm wide, pale yellow flowers during spring. Pittosporum eugenioides is native to New Zealand where it occurs throughout the country along stream banks, forest margins and in forest clearings from sea level to about 600 m. The variegated form grows a bit slower than the species itself. It has a tapering habit when young, filling out to an open topped tree later on. Prefers a sunny or partially shaded position in any well-draining soil. Is more tolerant of damp and heavy soils than most other Pittosporum species, but growth will be compromised. Tolerates coastal conditions, moderately strong winds, and medium frosts. Suitable for hedging or screening purposes. Good contrasting plant in mixed plantings. Also ideal as a specimen tree in particular when pruned to show off the pale grey bark. Foliage is often used in floral arrangements. Cultivar of the New Zealand native Pittosporum tenuifolium (kohuhu) with dainty foliage and black branches. Fast growing evergreen shrub or small tree. Tiny leaves with a silvery-grey sheen, round initially and gradually becoming oval in shape. Prefers a position in full sun. Growth is a bit more open in partial shade. Grows well in any well-drained soil other than heavy clay. Reasonably drought tolerant. Avoid wet sites. Frost-hardy throughout New Zealand, and in general tolerates moderate frosts. Fertilise with general purpose fertiliser in spring and autumn. Responds well to trimming. Attractive plant with delicate foliage and lovely colour contrasts of silver leaves and black branches. Great choice for hedging purposes. If you wish to grow Pittosporum tenuifolium 'Silver Sheen' as a specimen, plant it where you can see the leaves shimmer in the sun. Cut branchlets are suitable for floral art. Evergreen shrub or small tree with variegated foliage, native to New Zealand. Leaves are flat (as opposed to wavy like the species itself), greyish green with white margins, similar to Pittosporum tenuifolium 'Argenteum Variegatum' but larger and more pointed, to about 5 cm long. Small (to 1 cm wide) dark reddish-black, honey-scented fowers with reflexed petals in spring. Dark grey bark. Prefers a sunny or semi-shaded position in any, well-draining soil. Tolerates medium frosts and is frost hardy throughout New Zealand. Pittosporum tenuifolium is not as tolerant as Pittosporum crassifolium of coastal conditions and strong winds, but copes reasonably well with dry conditions. Tends to loose its leaves if conditions are too wet. Ideal as a specimen tree for foliage colour, or as a hedge or screening plant. Golden-leafed cultivar of Podocarpus totara, a New Zealand native conifer. Pyramidal to columnar growth habit. The needle-like leaves are linear, sessile, 1-3 cm long, 2-4 mm wide. Leaf colour varies somewhat during the year from light green in spring, changing to yellow in summer, and deepening to golden yellow in winter. Plant in full sun for best foliage colour. Prefers well-draining soil. Tolerates dry conditions once established. Responds well to trimming and is suitable for hedging purposes. Tends to have a bushy habit with foliage from ground level, but can be trained to grow as a specimen tree from an early age by selecting one shoot to become the central leader and gradually removing the side shoots. Make sure to stake the tree when planting in an exposed position. Suitable for coastal gardens.Tolerates moderate frosts, and is hardy throughout New Zealand. Smaller and slower growing than the species itself, Podocarpus totara 'Aurea' can be accomodated in garden settings for many years. Forms a nice dense hedge.